NH: How was the gig for you Jeff? JL: It was bloody marvellous, actually. I enjoyed it probably more than I've ever enjoyed it, because I wasn't expecting that at all. I didn't know what to expect, to be honest, because it's been so long since I did it. But as soon as I stepped on stage, it was like: "Wow!" It was this warmth, this really nice atmosphere. nothing like I've experienced before. NH: Had doubts crept in about being able to hold a big stage after so long away? JL: My worst fear was: what if no one takes any notice? If they just go [weak sigh] about it. But I was really hoping it would be absolutely marvellous. Which it was for me. I was chuffed to bits. NH: In ELO's later tours, was there an element of both you and the audience taking it for granted? JL: Yeah. And now it's different altogether from what it was. I've never seen people that attentive before, and that interested in songs, and thousands and thousands of people really enjoying singing along to them. That's a great feeling when you're a songwriter. NH: Do you feel your work is loved, in a way that you hadn't realised? JL: To be honest, yes I do. I don't want to sound like a bighead when I say that. It's a surprise to me, because it's been so long since I did it. And people think about my music slightly differently now than they did in the seventies or eighties. For some reason the people who were always sceptical before have changed their minds about it. Some of the people who used to have a go seem to have changed to a more civilised approach! NH: The studio has always been your favourite place to make music. But did the success of the Hyde Park gig make you wonder why you hadn't done it before? JL: Not really. It never felt right before. But this time it did, because of the buzz I was getting about the music now. I was astonished to see the amount of people - I've never seen that for probably thirty-five years, in American stadiums. I won't do it again quickly. But I certainly will do it again. Because I know that I can now. NH: Is ELO a going concern again? JL: Yeah. Because it really felt nice to finally have my name in it, and not just be hiding behind those letters all the time. It gave me a lot more confidence. NH: Was it painful for you when the name wasn't wholly yours, and drummer Bev Bevan was touring with ELO Part II in the 90's? JL: There were quite a few of the old band members going off doing weird things. That's not something I want to talk about, if you don't mind. NH: You said recently that all your dreams have come true, because you wished for them so hard. Is that a problem, as far as what you do next? JL: I know what you mean. But I still love music so much. I've had all the treats that I've had so far, but there might still be ones lurking from new artists that I could produce, where I go: "Wow! That's the best voice I've ever heard!" I've not given up on having new, fun things, and being excited about stuff. And I am working on my new album at the moment. I've got about half a dozen new tracks that I'm proud of, and a few that aren't quite finished yet, and I'll be doing a couple more new ones when I get home. 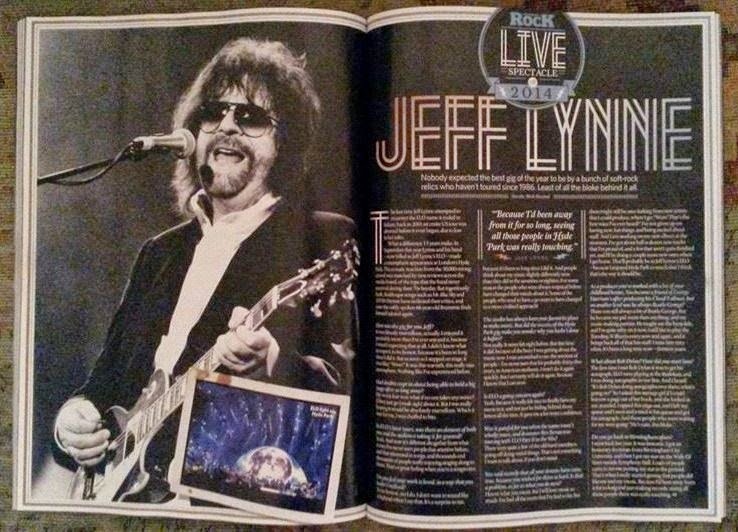 That will probably be as Jeff Lynne's ELO - because I enjoyed Hyde Park so much that I think that's the way it should be. NH: As a producer you've worked with a lot of your childhood heroes. You became a friend of George Harrison's after producing his Cloud 9 album, but on another level was he always Beatles George? JL: There was still always a bit of Beatle George. But he became my pal, more than anything, and my music-making partner. He taught me the banjolele, and I'm quite nifty on it now. I still like to play the Traveling Wilburys every now and again, and it brings back all of that fun stuff. I miss him very often. It's been a long time now - thirteen years. NH: What about Bob Dylan? How did you meet him? JL: The first time I met Bob Dylan it was to get his autograph. ELO were playing at the Budokan, and I was doing autographs in one line. And I heard: "It's Bob Dylan doing autographs over there, what's going on?" So I asked this teenage girl if I could borrow a page out of her book and she looked at me puzzled. I ripped this page out, and I left my queue and I went and joined in his queue and got his autograph. And these people who were waiting for me were going: "He's nuts, this bloke." NH: Do you go back to Birmingham often? Interview: Copyright © TeamRock Limited 2014. All Rights Reserved. ELO Beatles Forever [ELOBF] recommends and endorses Classic Rock magazine to those enlightened folks who enjoy the music of ELO, Jeff Lynne, Roy Wood, The Move, The Idle Race, 'Brum Beat', The Beatles and related artistes.